If you’ve survived the gift-giving frenzy of the recent holiday season, then perhaps you gave or received a connected device. Whether it was a smartwatch, an activity tracker, a home appliance, or some other bit of technology, you may be part of the growing user base for consumer IoT devices. These products are intended for use by a wide variety of users, with a wide variety of experiences and skill levels, in a wide variety of contexts. Because they are not necessarily traditional technology products, there are sometimes novel ways of interacting that may not be as intuitive as the designers hope. Special attention needs to be paid to the user experience and interaction design of these products to ensure that they’re effective and efficient. Traditionally, product designers have been able to exert a lot of control over how users interact with their products and thus could dictate minute details of how those interactions would be supported. Now, because devices are more and more interconnected, a user may not be accessing a product directly. That product might be part of a larger network of interconnected products accessed and controlled through an interface over which the product designer has no control. This potential issue extends beyond just the interaction design into the information architecture and even the visual design of product interfaces. As an example, let’s consider a simple setup of two connected devices. An Amazon Echo and an Ecobee 3 connected thermostat. 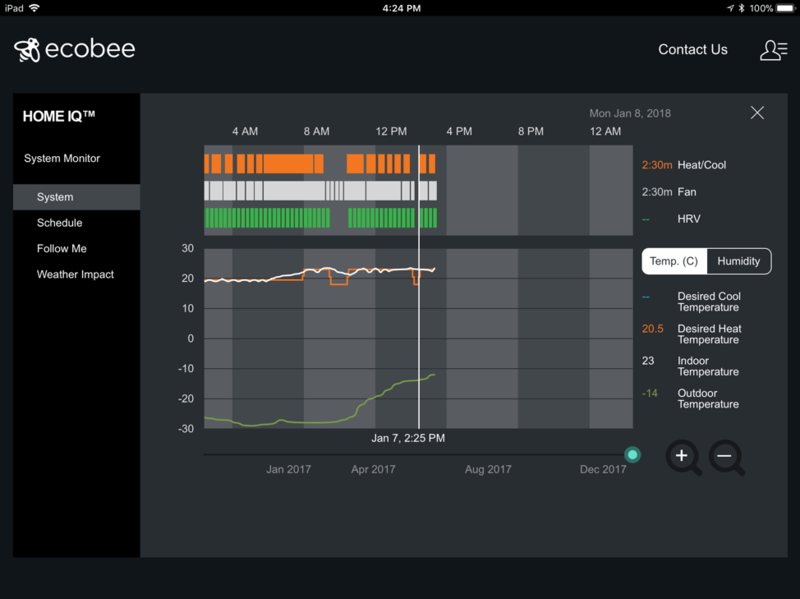 The Ecobee itself is capable of doing all the things a regular thermostat does, plus a few things that they can’t. For example, since it is wi-fi enabled, it can display the local weather in real time, and since it has wireless remote sensors it can tell you the exact temperature in specific rooms where those sensors are placed. 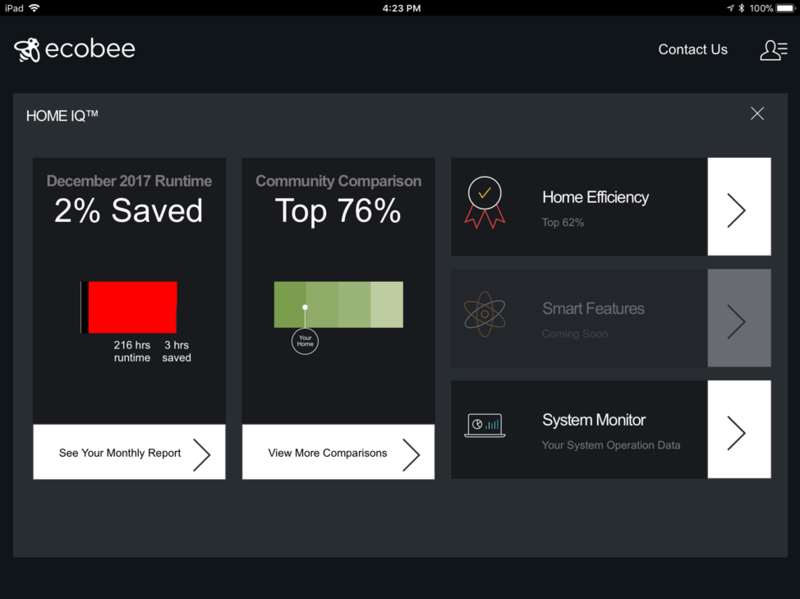 The real power of the Ecobee, however, is displayed when you interact with it through the larger screen of a tablet, where you can see the heating and cooling trends of your house over time and how they are influenced by the weather, or how your energy consumption compares to the average in your neighbourhood. While you can interact with the thermostat directly, it’s connectedness allows for it to be accessible through a variety of different devices and its functionality is increased through using those connected devices and remote sensors (see Figures 1, 2, and 3 below). Fig 1. On a tablet, the Ecobee can display usage patterns, trends, and your data – displayed in a way that is meaningful to the user. Fig 2. 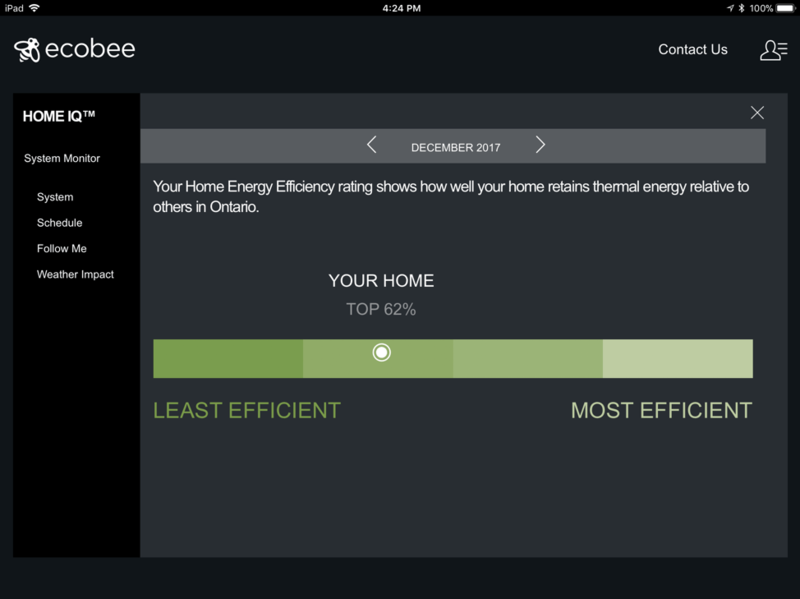 Tablet display of home energy efficiency in the month of December. Fig 3. Tablet display showing indoor, outdoor, and desired temperatures throughout the day. One of the main complaints from earlier versions of the Alexa was the skill that controls the Ecobee. It had to do with the syntax of the commands (see Fig 4 below). You see, this type of syntax is used with some skills and not in others. For example, you don’t have to ask Alexa to ask the Nest anything. But if you want to voice control your Roomba, Alexa has to be kind enough to relay the message. If the user doesn’t understand these little details, the interaction with these devices can quickly become frustrating. Good UX is about understanding and then meeting user expectations. Great UX is about understanding and then exceeding user expectations. In the IoT domain, a user task flow may span different devices, different interaction paradigms, and different contexts of use. This increases complexity by orders of magnitude for the designer. Conversely, user expectations are also increased because users expect the experience of using these disparate connected devices in concert to be more than the sum of their individual experiences. The key to creating great IoT user experiences lies in understanding and designing for the fluid nature of IoT interaction through good primary research into user needs. The fundamentals are still the same: you need to understand who your users are, what they’re trying to do, and the context within which they’re trying to do it. The difference is the scope of that context might be much, much bigger than the product designer might imagine. Dominira believes that behind every well-designed product or service there is a thorough understanding of the actual users and their needs. Dominira Saul, having presented many influential research and design outcomes to clients at all levels of the private and public sector, is very adept at putting his beliefs into practice. Dominira remains focused on ensuring clear transfer of design recommendations and most importantly, rationale to our clients. Dominira is committed to working closely with clients to ensure their success. He is a fluently bilingual communicator who has lectured at the university level, and delivered many training courses. Dom has an MSc. in User Interface Design from London Guildhall University, a BA in Psychology from Carleton University and over 12 years of usability research and interaction design experience in the UK and Canada.